North Korean leader Kim Jong-un visited a military unit on the western coast, where he ordered soldiers to "drive the enemy into a fire pit if so ordered," the North's state press reported on Tuesday. The Rodong Sinmun daily said Kim visited a defense unit on Wolnae Island on the western coast on Monday, the first day of joint annual South Korea-U.S. military exercises, accompanied by military top brass. His entourage included army chief Choe Ryong-hae, Minister of the People's Armed Forces Kim Kyok-sik and Kim Yong-chol, the director of the General Reconnaissance Bureau. The army unit is tasked with striking Baeknyeong Island, one of South Korea's five northwesternmost islands in the West Sea. Wolnae Island lies about 11 km from Baeknyeong. North Korean leader Kim Jong-un waves at officers after inspecting a military unit on Wolnae island near the western sea border with South Korea, in this photo released on Tuesday by the [North] Korean Central News Agency. 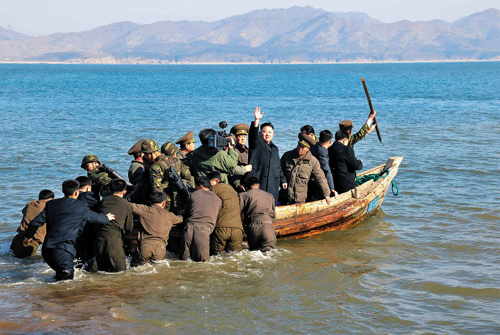 Kim also visited a fishery and another military unit there. He and his late father Kim Jong-il also visited the fishery two days before the North shelled Yeonpyeong Island in November 2010. It is about 80 km from the coastal artillery battery that fired rounds at Yeonpyeong Island. The military unit near the fishery is believed to be a long-range artillery battery near the Northern Limit Line, the de facto maritime border. South Korean Defense Ministry spokesman Kim Min-seok sought to explain North Korea's recent grandstanding, telling reporters, "It seems that the regime is tightening control internally and trying to pressure [South Korea and the U.S.] into changing their North Korea policies." But he said there is no reason to be alarmed by the North's "psychological tactics." "As of now, there's no sign of the North launching a provocation anytime soon" or conducting another nuclear or missile test. There has also been no repeat of the GPS jamming attack launched during previous South Korea-U.S. drills since 2010.